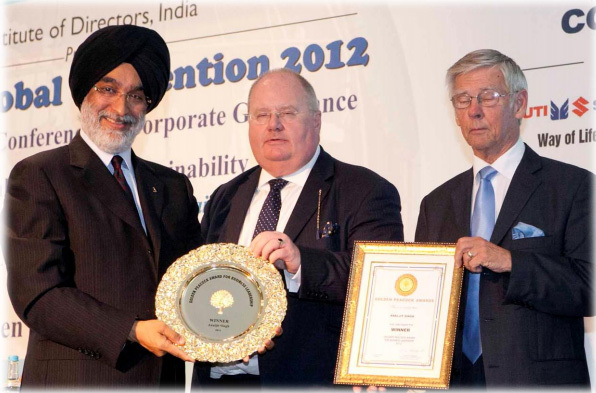 Founder & Chairman, MAX India Ltd. receiving Golden Peacock Award for Business Leadership 2012 from The Rt Hon Eric Pickles MP, Secretary of State for Communities and Local Govt.UK . Mr. Singh is the Founder of Max India, Max New York Life Insurance, Max Healthcare Institute and Max Health Insurance.Today, Max India is a corporate icon and service-oriented business - Life Insurance, a Joint Venture with a Fortune 100 company – Healthcare and Health Insurance and Clinical Research. Today, Max Group’s annual turnover is INR 80 billion, with a customer base touching 5 million. It has over 500 offices across India, with strength of about 54,000.He has been awarded one of India’s highest civilian honours, the ‘Padma Bhushan’, by the President of India. Mr. Singh is a Member of the Prime Minister’s Joint Indo-US CEOs Forum, and Chairman of Vodafone India, India’s second largest mobile telephony services. He is a Director in several Indian icons - Dabur India, Tata Global Beverages, Hero MotorCorp and Sofina, Belgium. He is enhancing India’s academic standards. He is on the Board of Governors, Indian School of Business (ISB), Chairman, Indian Institute of Technology, Chairman, the Doon School, a leading public school in India. He is associated with the National University of Law. Mr. Singh is a pioneer of CSR in India through Max India Foundation (MIF), his Social Service arm. MIF is providing improved access to quality healthcare for underprivileged children and women. A well-known diplomat, he is the Consul General (Honorary) of the Republic of San Marino.Senator Hillary Clinton has lauded his efforts in forging several successful Joint Ventures and promoting Indo-US ties.